I just finished a 10 day bike tour. 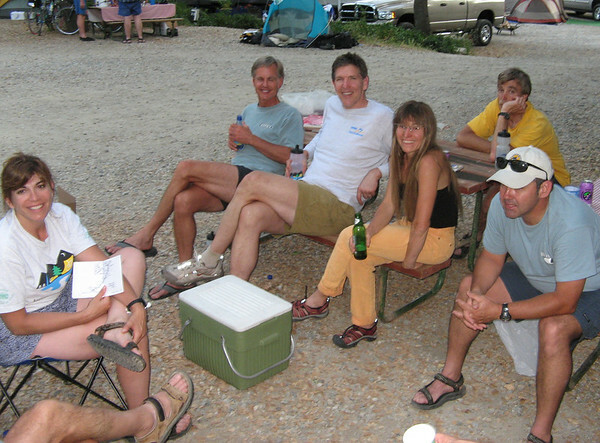 Actually it was two tours combined and I it was a great time getting to ride the bike so many days with good friends. 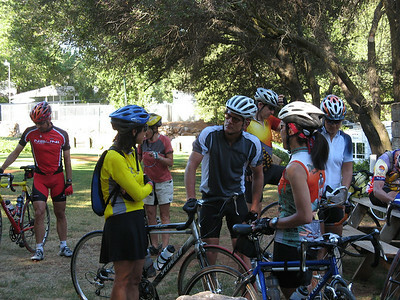 The first 3 days was a club ride from San Jose to Bear Valley. We started at Donny’s house with a large group. We then headed over Mt. Hamilton to Patterson with a total mileage of 75 miles, 5900 feet of climbing and an average speed of 15.1 mph. It was getting rather hot when we arrived and I was glad we go in early before the real heat hit. As in the past, what kept me moving fast was getting a root beer float at the A&W there. The second day the 3 day ride was from Paterson to Columbia, 87 miles and only about 2,800 feet of climbing. That allowed a faster average speed of 17.4 mph. 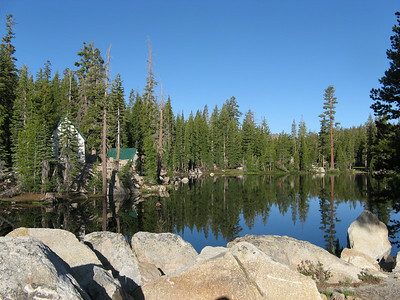 We spent the night in the campgrounds that previously was the starting location for Sierra to the Sea, before we changed the start to Bear Valley. 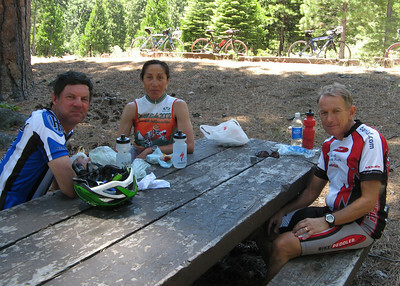 The last day of the 3 day ride took us to Bear Valley. I still felt good after the 51 miles and 6800 feet of climbing. The pace was a bit more relaxed at only 13 mph. I was able to win the race for the city limit signs and county signs by using some tactics (some would call it bribery). I was glad I had reserved a bed in Base Camp there because it was cold that evening. Sunday was the first day of Sierra to the Sea. 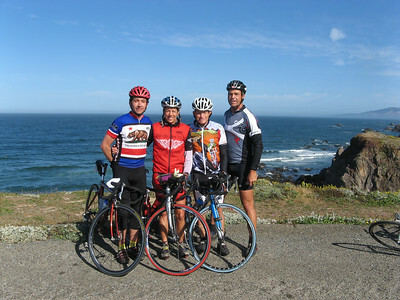 Although the official route no longer included the option to head up to the Pacific Grade summit, four of us did it anyway. Cory was really pushing the pace and it was all I could do to keep up. After returning back to Bear Valley, where we met Kem who was going to join us at that point for the regular route, I went into check out and when I returned found out I was left alone, so I had to speed down highway 4 to try to catch everyone. I was able to finally reach them before the first rest stop. After reaching Jackson, the total for the day was 92 miles, 6,400 feet of climbing and an average speed of 16.5 mph. Day 2 of STTS, from Jackson to Ryde, was the fastest paced day. 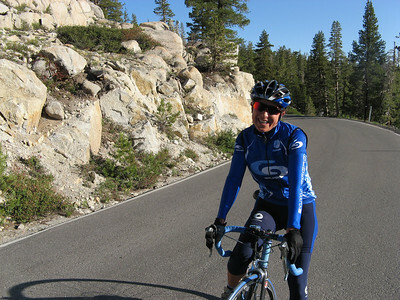 I was in a group of about 8 riders, later referred to some others as the “blue train” because many in the group were wearing the same blue jersey from John and Cory’s Cloud 9 bicycle company. The first part was some rolling hills which I loved, then the ride flattened out. Some joined us along the route, then dropped out. At one point we were doing an echelon pace line, which is a two lane, fast rotating pace line. I didn’t mind some other riders drafting behind us but when some decided to jump into the rotation it drove me crazy so after awhile I asked to go back to a regular pace line. We ended up with 75 miles and an average of 19.3 mph. 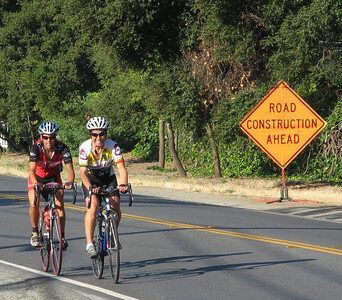 By Day 3 of STTS, from Ryde to Lake Solano, I needed to slow down the pace a bit. 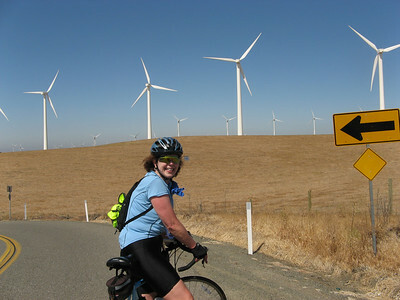 Actually I had no choice to slow down becasue we went through the wind farms, the place where they had a bumper crop this year of wind. I was sure glad that Kem was out front pulling much of the time because I felt I was being tossed all around the place by the very strong winds and was even thinking of taking on some ballast. 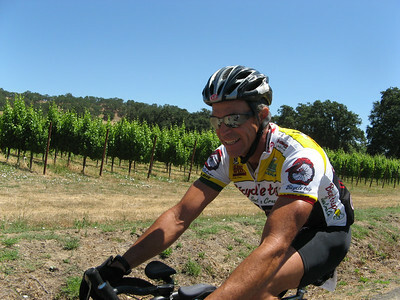 On Day 4 of STTS we picked up the pace again as we rode to Calistoga. The ride started out with a flatter section then the hills. John C. moved out to the front and started to climb faster. It was all I could do to hang on his wheel to the summit, but I was satisfied with that since the rest of the group of 10 had dropped off the back. The second climb was more difficult for me and I could not manage to hang on John’s wheel again (nor could any other in our group). I then saw a rider coming up from behind, who could it be? It was Adam, a 16 year old on our tour. A few miles before the rest stop I got a flat. I was glad Miguel came along and joined to help pull since I had told the group to go ahead and I would meet them at the rest stop. 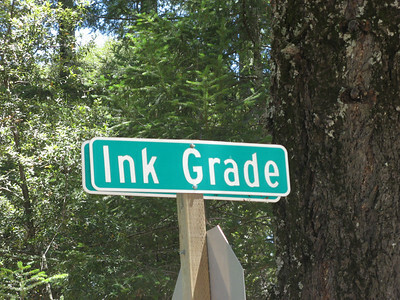 We then headed to the famous Ink Grade, a climb of about 4 miles. I was determined to win the climb up the hill. On the way up I mentioned to some people we passed that Marguerite and I were racing to the top and one younger guy thought it would fun to join in the race, even though we had already been racing for 2 miles. I was finally able to open up a bit of daylight with the others on the climb. 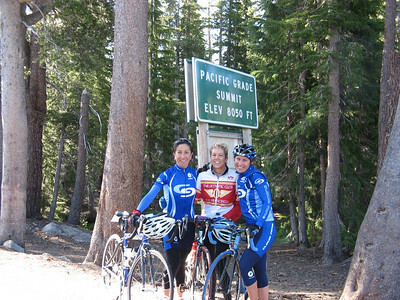 For the day we went 67 miles, 4,300 feet of climb and an average speed of 17.0. Day 5 included a large group visiting the the ranch of Marguerite’s parents, with a large private lake, just off the official route. People enjoyed swimming, canoing and some of us just splashing around. Gee I hate it when I am out done by the dogs but everyone loved the place and a chance to meet her parents. 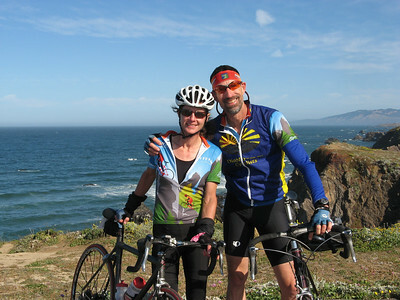 Day 6, the ride to Olema was totally off the official route. A few of us went straight to the coast, down highway 1. Then over Coleman Valley to Occidental for breakfast. Miguel was too fast up the hill for me to keep up. Then it was a back over Coleman Valley to the coast, down the coast to the rest stop. We then went on the Franklin School road loop down near the coast, then we went inland toward Petaluma, then back out to Olema. Total miles were 84, averaging 16.0 mph with 6400 feet of climbing. Day 7, the last day of Sierra to the Sea, took three of us first up Mt. Tam, then down to the official ending at Golden Gate Park. After a quick lunch we continued down to San Jose where my car was parked. Again we seem to have no time to enjoy the ride of 95 miles, averaging 16.8 mph. Gee, how could this 10 days gone by so fast.